As is common at my age, I have played with the coaching staff at Humboldt St and we spent some quality time rehashing old and new stories over a few pints in the taproom at the Redwood Curtain Brewing Company. The good people of Redwood Curtain have figured out some excellent ways to combine flavors and have quite the selection and I wish I had time to try them all, but families and rest called to us as we parted, going our separate ways. Heading home the next day there was an opportunity presented that is unique to this special area of the world. I pulled off the freeway and drive for about a half mile or so… and then I drove through a tree. As they so often are, the roads less travelled are the most rewarding. Last week we here at Hail Pelicus extolled the virtues of the Northern California Referee Exchange program and how travelling to other unions and even countries to referee rugby is one of the great advantages of being part of this society. Unfortunately, not everyone has realized that you must, as they say, speculate to accumulate. There needs to be some quid before the pro quo. We are still looking for a volunteer to host incoming Virginia referee Patrick Benner, who will be here on March 28 and will partake in the tournament at Napa. This, of course, includes billet and ferrying him around as per custom (as well as not allowing him to pay for a drink). Many of you have been at the receiving end of the Virginia hospitality, so you know how important their refs are to us. Beyond the customary fellowship and good will these exchanges provide, our exchanges enable us to provide growth and official recognition for our own referees. If interested contact Bjorn Stumer at bstumer@att.net. “In an official league match I need to keep track of all of the substitutions – especially the front row subs – yet coaches are constantly swapping players in and out without my knowledge. I often turn around to see new faces on the field (and occasionally familiar faces that have returned) and have to talk to the captain about who has been subbed and when. How should I manage this situation? Also, I have heard that in Collegiate D2 if there is a large enough lead then the referee should allow open subs. Is this true and if so, are there any other competitions that allow this that I should know about? Thank you for the question, Name And Address Withheld as this is something we all struggle with. Before we get to the answer I must say that I am a great admirer of your work and as a young man I would scour magazines for some of your outstanding prose. I salute you! I passed this question on to NCRRS President Pelicus Iudex Pennipes and here is your answer, straight from the top. “The simple fact is that subs need to come through the ref. Not doing this is a penalty. An easy solution would be to require the teams to keep track of their opponents’ substitutions, ie: I have to report to the other team before I am allowed to sub a player. As for open subs, this would need to be a competition decision. I believe that in small college if there is a 20 point difference the losing team may utilize open subs. On a personal note I would like to remind everyone that it is required that a referee verify blood before allowing a player off for a blood sub as well as verifying the lack thereof before allowing the player back on. There are many reasons for this, firstly the referee must note the time as a blood sub has a limited shelf life, but also actual blood needs to be verified so that sneaky coaches are not just giving a player a 10 minute rest in a hotly contested match. Pelicans are doubling up and games are still occasionally uncovered, so we need referees. Please go to assignr.com to confirm your availability and matches, or if you haven’t received an assignr.com account, contact Pete Smith at me@petesweb.com to let him know you are available. To get an assignr account please contact our Scott Wood at rscottwood@gmail.com. He will get you all the information you need to sign up and announce your availability. Both teams looked good as we kicked off at Cal Maritime’s field. Cal Maritime worked some box kicks to put pressure on CSUMB, and was able to get to tries in the first 10 minutes of the game, and a few more later in the half. CSUMB was able to take advantage of some mistakes and crept up with 2 tries of their own. In the second half, Cal Maritime’s speed and fitness opened up the game as they were able to get the ball out wide with support and break some tackles. CSUMB never gave up though, and got a final try at the very end of the game. It was a pleasure reffing both these teams. Chico State dominated from the outset. Quick ball at the breakdown kept constant pressure on the SF State defense. SF State played with grit all 80 minutes. Upon first look, one had to wonder what type of game it would be between Fresno and EPA Bulldogs because Fresno had over 30 guys dressed for the day and EPA traveled with 17. That wonderment ended with the kick off from Fresno. Within 40 seconds of the start, EPA had spun the ball, stiff armed one Fresno player onto the ground and dotted the ball down for a converted try. Looks of bewilderment were present on the Fresno side, but they finally settled down after giving up an unconverted try in the sixth minute. For most of the first half, and really the game, the play was pretty even with hard hits, steals and little mistakes from both teams. Fresno was able to get a converted try in the 25th minute, and the Bulldogs were able to gain two penalty kicks prior to halftime. Halftime Score: Fresno 7 – EPA Bulldogs 18. The second half was a continuation of more hard hitting rugby, but the try zone only saw the Bulldogs enter it. EPA was able to dot three tries, one converted, in the second half while Fresno seemed have gaps in their unity whenever something seemed to be promising, squandering several opportunities. It was an enjoyable game to referee with both teams doing their best to work the referee, yet all continued to show respect for the referee, the game and their opponent. Final Score: Fresno 7 – EPA Bulldogs 35. With only 17 players for the EPA Bulldogs, they asked for a shortened B game and actually borrowed one reserved Fresno winger as well. This B side game showed promise for what may come for Fresno, but continued to demonstrate that even though they were tired, the Bulldogs can continue to pack a punch. I think every possible substitute for Fresno made its way into the game, and the various bodies helped Fresno win the B side match with two converted tries to one unconverted tries. Final Score: Fresno B 14 – EPA Bulldogs B 5. Teams switched matches making this a home match for South Valley in San Juan Bautista (about 10 minutes past Gilroy) with a soccer field just off Hwy 101 amongst the hills. Google played a s a team in their forwards denying most possessions and their flyhalf made the gain line each play & then either scored or passed off with South Valley leaving holes in their defense as a result was 10 to 5 try margin. When South Valley backs had the ball they scored on the few times they had it out. It was perfect. It is 325 miles door to pitch for me to travel to Humboldt St University. With an 11:00 start for the women’s game I got up really, really early in the morning – bags already packed – and hit the road. Travelling north through some of the most beautiful scenery in the world (see the into to this newsletter) and stopping once for coffee and a breakfast sandwich I got lost in the moment and just cruised. I put on my travel mix and drove. And drove. And drove. I finally reached my destination and pulled in to the parking lot next to the on campus facility just as the final strains of the final song on my playlist, George Gershwin’s “Rhapsody In Blue”, faded away. I looked down at my dashboard clock and it read 10:00. Absolutely perfect. 325 miles and I timed it to the minute. What a way to start a rugby day. I walked out on to the pitch and it seemed surprisingly empty. A couple of ladies were there setting up goalpost pads and barriers but that was it. Well, I smugly thought, I guess the teams were not nearly as precise as I was. Speaking with the ladies setting up they gave me a funny look and said, “you’re here early”. I replied I was right on time: 1 hour before kickoff. That’s where you’re wrong, they said. The first match kicks off at 12:00. As it happens, when I was communicating with the teams I had asked for the games to be moved back an hour to accommodate the long travel time. Apparently the teams got together and decided that yes, that was a fine idea. Unfortunately, that is where it all broke down and nobody told me so I assumed the original game time was still valid. What to do? It was a nice, warm morning so I lay down on the sideline with my bag as a pillow and went to sleep. A nice 40 minute pre-match nap seemed just the ticket. By the time my mind lazily swam its way back to consciousness there was a lot more activity and I was ready to get started, because, you know, rugby. Humboldt St, if you haven’t been up there recently, no longer plays on a muddy anklebreaker of a field but have a nice new facility on campus with artificial turf and actual rugby lines painted on. There is even a scoreboard with “Jacks” and “Guest” listed so I asked the HSU coach if the women’s team were called the “Jills”? No, apparently not. They are Lumberjacks and they’re ok. Both sides were eager to play as they had each had a series of forfeits/washouts and had not played a game yet. This seemed evident as the game started with a series of knock ons and penalties. Both sides were composed of what I would consider the typical college D2 mix: a couple of savvy verterans supported by eager rookies who have great enthusiasm but only a passing knowledge of the game. Unfortunately, the UNR rookies were giving up penalties and Humboldt was taking advantage with a series of quick taps with the player tackled immediately for another “not 10” penalty. After a few of these and a warning it happened again so off goes a prop to the bin, much to the frustration of the Reno captain who told her team in no uncertain terms to get back on penalties. That being said, the game was certainly not unbalanced. Both sides were attacking with pace and Humboldt gave up their share of penalties that Reno was able to take advantage of. Humboldt got the first two tries – with one coming while a player up – then UNR scored before the half once back at full strength for a halftime score of 12-5. The second half was a much more wide open affair thanks to the increased discipline of the teams. Humboldt kept scoring but Reno kept replying and wouldn’t go away as each time exchanged 3 tries. Humboldt St converted all of their tries (their kicker was outstanding on the day) while Reno missed one from out wide – this would prove to be significant. Late in the second half Reno started committing more “not 10” penalties again and that resulted in another sin bin, yet this time the Wolfpack seemed energized and scored on a breakaway almost immediately. Adding another try with 2 minutes remaining gave UNR their first lead of the day at 36-33. The sin bin was allowed back on the field and both sides were at full strength for the finale. Humboldt St never gave up, though, and showed their character. The ensuing kickoff went deep and was knocked on by an onrushing UNR flanker. The ball bounced about 10 meters forward only to be picked up by a Reno teammate who started running upfield. Penalty, off side from a knockon. As she had done all day, the Lumberjack’s scrumhalf tapped quickly and ran (with Reno getting back 10 – nice!) and was tackled about 10 meters short. Some crashes off the side sucked in more defenders until the ball was spun right to expose an overlap. The Humboldt winger went in for the score with less than a minute on the clock to retake the lead and the crowd went nuts. With the conversion missed the score stood at 38-36 and we are at the final play – there is time for a kickoff but that’s it. UNR kicks off and Humboldt knocks on and Reno regathers. More phase play as the ladies look for an opening. The ball gets perilously close to the sideline but the players stay in the field of play and we continue. The fatal mistake finally comes and a Reno player knocks on and the grateful Humboldt captain picks the ball up and kicks it out of bounds to end the game. What a match. Whew! After a thrill-a-minute women’s match I was ready and excited for the Humboldt St men’s match against Solano JC. Humboldt St has been a rugby presence in Pelicanland for decades but Solano JC is a new program, so a narrative has already been set for the game. Interesting fact: the team captains, Luke (Humboldt) and Chris (Solano) had played together in high school in Dixon. That is the kind of thing we are seeing more of in Northern California and it is a good thing, indeed. The first half started and played to type as Humboldt used their experience and cohesion to jump out to a 2 try lead. A missed penalty (CLANG! Off the post!) from Solano was their only scoring attempt as Humboldt’s defense held strong. This was not a completely one sided affair, however, as Solano has some dangerous players, especially their captain Chris who leads by example from the centers and a massive rookie wearing #5 that floated back and forth between 2nd row and prop. Both of these players were strong on defense and very difficult to bring down when going forward. Humboldt St was off with both of their kicks – a trend that would come back to bite them later. The half ended with Humboldt St’s flanker getting a yellow card for repeated infringement and then throwing the ball away. Temper, temper. With a man advantage for 9 ½ minutes, the second half saw Solano JC finally start to get things going. Humboldt crossed the line early for a 3rd try (unconverted again) but Solano was able to hit back with a converted try of their own. Both teams were tiring and that opened the game up tremendously as previously tight defenses started showing gaps. The Humboldt #10 in particular started slicing through the backline as angled runs and dummies confused the Solano defense, particularly in 2nd and 3rd phase play. With both teams back at full strength the game really started to move. Humboldt’s counter attacking off of Solano kicks was deadly and that set up yet another unconverted try, but Solano hit right back for a converted try to make the score 20-14 in favor of the home side. With 5 minutes to go Humboldt finally was able to get the breakaway they needed to seal the game as their replacement center was released and crossed the line untouched . As the HSU player sauntered to the posts to put the ball down the speedy winger from Solano never gave up and chased him down to punch the ball out of his hands before the try could be scored. Unfortunately, he had circled all the way around the ball carrier and punched it forward towards his own goal and then picked the ball up so I blew for a knock on and a scrum. (NOTE: I sure as $%#@ wasn’t going to call that a deliberate knock on and award a penalty try.) This was one of the best plays I have seen as this young player in his second game ever never gave up and saved a try. I was told later that this also was not the first time the HSU player had done this and been caught trying to center a try. Possibly the lesson will be learned now. The error was compounded when on the ensuing scrum Humboldt picked off the back and was tackled and after the next few phases were eventually held up in a maul resulting in a turnover. Solano won their scrum and cleared their line. More pressure on HSU forced another turnover and eventually a penalty against Humboldt 10 meters out. The Solano captain, Chris, decided to take matters into his own hands at that point, tapped and went. He targeted the player in front of him on the try line, lowered his shoulder and BOOM! went right over the top of the defender to score the try. A third successful conversion saw Solano take their first lead at 20-21 with three minutes to go. There must be something in the air in Humboldt (no, not that) because, much like the women’s match, the home side never gave up. They took the ensuing kickoff right back down the field and 3 phases later were able to score under the posts to retake their lead. With this basic conversion the HSU kicker was finally able to break his duck and restore the 6 point lead. With barely a minute left Solano gave it their all but could not break the Humboldt line and after a turnover the Lumberjacks were able to put a final try on the board (unconverted, of course) to give a final, flattering, scoreline of 32-21. Both Humboldt St games were won by the home team after building, then losing a lead and finally trailing for the first time in the match with less than 3 minutes to go. You can’t write a script like that because nobody would believe it – you would be accused of just manufacturing drama. It was true, though. Trust me, I’m a referee. Another beautiful rugby day in Northern California saw me traveling to Cal. State East Bay. Life West plays in a stadium with plenty of seating and parking. Another artificial turf field, but very nice venue. Life West woman, in their first year, hosted the Amazons from Sacramento. Early Saturday my game was switched by Pete “the scheduler” Smith. Pete needs a major shout out for the thankless job of juggling planned, unplanned and managing the last minute changes. Last I talked to Pete he had scheduled himself for three games on Saturday. I had refereed the Amazons a few weeks ago in their first game of the season. They looked powerful and skilled then. In my pre-game chat with Life’s captain #10 Jen, she stated that for many of their players this was their third game. The Amazons controlled the first twenty minutes with relentless go forward, forcing tackle after tackle for Life. Amazons center #13 Ofolangi Mailagi was my player of the game scoring two battering trys. As the second half worn on the Amazons tried and Life’s super fast back three started making long runs. Life’s winger scored a first half try. Half time Sacrament 10 Life West 7. The momentum changed in the second half. The bigger Amazons were being out worked by the speedy Life back-line. Captain Jen scored trys at 6 and 15 minutes to up the score to Life 21 Amazons 10. The Amazons were playing hard and then Sac’s #13 injured her leg. Wow their best player injured, down by 11 with ten minutes left. Sacramento showed the heart of a champion and as one of their players put it “pride kick-in”. Yes Sacramento scored trys at 35 and 38 minutes. With one conversion that put them up by 22-21. What a fun game. But the rest of the league needs to by wary of Life. This was only their third game. Another beautiful day in sunny California. It was actually too warm for all of the running. After 2 games the night before, I was thinking this would be slower paced; I was wrong. Some great running by both teams, long tries; exciting for the crowd of spectators. Humboldt played short for the first half and Mendo took advantage with 8 tries and a 44-5 halftime lead. We played 10’s in the second half, with free substitution. That provided all of us an opportunity to get even more running in; everyone had a great day of rugby (except the MVP of the match from Humboldt, who needed several staples on top of his head from the hospital before he could join the after match party). Great food, as always. Three had to shoot the boot from Luke’s quite large boot; too funny! Two top of table table squared off in a physical on nice day in Napa. The match was pretty even at the start, but Colusa was ultimately undone by penalties that lead to points for Napa and two yellow cards in the second half for foul play. Friday night was interesting. I reffed Marin at Piedmont’s Witter Field; Marin won 15-5. Witter is a stadium set in a canyon with concrete stands built into the side of the hill on one side of the pitch. The stands are separated from the turf field by a rubberized multi-land running track. After a Marin try, Marin was kicking the conversion in the first half. After the kick, I sensed someone next to me and turn to discover a middle-aged man wearing a black Marin Highlander hoodie. I assumed for a second that he was there to retrieve the kicking team. This individual then told me that I “had” to penalize the Piedmont crowd in the stands for their rude behavior. At this point I realized he was not part of the Marin staff and I told him I would do no such thing. At this point, the individual told me he was a certified referee and that, again, I should penalize the crowd. At this point I instructed the individual to get in the stands and instructed the Marin coach (Chet) that if the individual did not go into the stands, the match would be declared over. The individual went into the stands, remained there, and did not approach me again either during or after the match. After the match, Chet told me: (1) the individual is (a) the parent of the Marin 10, (b) the past president of the club, and (c) yes, a certified referee; and (2) the staff would talk to him about his inappropriate behavior. It is disconcerting to think that certified referee is walking around under the impression that he can (or that it would be an effective measure to) penalize fans. The matchup between UOP (2-2-0) and USF (1-2-0) usually is hotly contested. This iteration lived up to its predecessors. USF scored one converted try and a penalty goal to UOP’s two tries, one converted, as both teams competed for dominance (perhaps too much) at the breakdowns. Each team played hard and it was quite apparent this match would come down to the wire. In the second half, UOP scored a converted try and USF scored a penalty goal to bring the score to a narrow margin in UOP’s favor, 19-13. Each team lost a player to the sin bin for repetitive team infractions but neither was able to take advantage of their respective overlaps. With two minutes remaining and both teams a full strength, USF lost possession to a penalty which UOP a wisely decided to opt for a lineout. USF stole the ball and passed quickly left and was on attack 30 meters from the UOP goalline when UOP’s 14 stripped the ball carrier of the egg and scampered along the touch line to score a final second try. Game played under cold, foggy conditions at La Sierra community Park in Sacramento. The Capitals struck early and often with an effective kicking game and an outside attack. The Capitals controlled the tempo of the entire game in which there were only 6 penalties. Kick off by Lions into SJ 22. Clearance kick does not find touch. Lions run practically untouched back in. Including the 3-4 second delay between starting my watch and the actual kick, 33 seconds had expired. Oh boy, let me get out the abacus. But no. After yielding up a couple more tries, San Jose decided to make a game of it, and everyone was happier for it. Close to the half, they put pressure on the Lions, who made a hash of a clearance kick. The Lions winger was also offside, so we came right back to the 5m (from whence he started forward) for a penalty. Lions player decided to tackle not-back-1, and was saved from the bin by dint of the determined drive through by the supporting SJ players, who drove their man within arms reach of the goal line. He knew what to do. 17-5 at the half. In the second half, the visitors had the better of the set piece, stealing ball a couple of times in both lineout and against the head in the scrum. They were equal at the breakdown, and their goal kicker was good from 30m on more than one occasion. But they couldn’t stop kicking the ball back to the Lions fullback in the middle of the field. He made them pay again, and again, and again. You have to think — and the Seahawks coach agreed — that if they could have cleaned that up, that this would have been a close one. It LOOKED close, and yet the Lions put over 7 tries. Or 6, if you happened to be a certain ref coach who arrived a minute after kickoff, and so had the score wrong. Thanks, by the way, to Mr. Rauscher, for his thoughts during and after the game. And then it was off to Bonney Field (for a little round-ball action) which I see has been announced as hosting a couple of internationals again. It’s bigger than it was — 2000 more seats are already in, with another 1000 on the way. Bring your friends! This game was not as imbalanced as the scoreboard suggested. The home team had just a bit more of an edge in a few areas that led to points more often. Game played at the Sac State grass turf field. High fog left the grass wetter than it appeared and caused (?) many knock-ons. Sac State in general just out played St Marys. Sac States #3, Megin Saavedra was a prime example of a player who seemed to be at every breakdown and knew when to run with and when to pass the ball out. A good solid team effort. For St Marys, two high spots. Their scrums were outstanding (I gather due to some excellent coaching). And St Marys’ #11 Kaydee Valliere who scored two tries in the second half to make it a respectable game. Thanks for the outing ladies. Yet another day of glorious sunshine for a “winter” rugby match on my first visit to the fabled For Pete’s Sake field in Santa Rosa. Santa Rosa’s #8 opened the scoring nine minutes in with a push over try from a 5m scrum. Two minutes later, SFGG were pressing inside Santa Rosa’s half when their attempted chip over the defence was charged down, gathered, and run in for a try. Two more unconverted tries from Santa Rosa, one from a series of pick and go drives, and another from the ball being spun wide to their pacy wing, left SFGG trailing 22-3 at half time. The second half was a much tighter affair, with the teams trading converted tries early on, but neither team able to convert further opportunities. SFGG had their revenge in the B side match, running in 6 tries for a 34-0 win. Haven’t refereed or played at the Presidio field in years. Great location and view terrible field. Game was fun though. A lot of talent on the field meant a lot of pressure from the players too. The game started off in frenetic fashion with lots of open play but settled down with more structure after the first ten. SFGG were the better team with tactical kicking and OMBAC probably got the edge in the scrums as the game wore on. Overall, a good game with well matched teams. Silicon Valley started the season with 14 players at their first game with Modesto and lost heavily, this was the rematch several weeks later. Thoughts of a repeat were quickly changed when Silicon Valley scored off their first scrum with a strong break from the No 8. The teams went back and forth for the first half with both teams scoring three tries and all converted for a 21-21 half time score. In the second half, things carried on the same way for 20 minutes but without the conversions and a 33-33 score with 20 minutes to go. With 20 minutes to go, Modesto’s experienced but aging legs started to tire while Silicon Valley worked to keep their heads. They scored an unconverted try but then lost a player to a sin bin. Modesto worked hard to pull back the 5 points with a player advantage but Silicon Valley defended hard and successfully. Then, as their yellow card returned, they lost a player to a red card. Modesto attacked hard to get the try back but the Silicon Valley defense was up to the task and then managed a last second try to finish with a 10 point victory. EDITOR’S NOTE: The Varsity Cup competition flew in a member of the USA Rugby A Panel (also known as the Northern California B panel) for this match. We have no report but from the score it looks like a tight, back and forth affair. This was the first of three games at St Mary’s state of the art rugby stadium. Indeed, it was the only competitive match of the day. One of the stated objectives of the game is ”as many points as possible” in a fairly played match. This was achieved in this fast, good spirited game. Although St Mary’s was the better team on this day, Sierra in terrier fashion kept coming back and kept it close. Kudos to both teams and their coaches. Comment of the weekend. In my other match, one side was penalized for off sides at a line out. Its back entire line had advanced about 5-5 meters from their proper on sides position before the ball was played back from the lineout and the cautionary hand lowered. They could almost of danced cheek to cheek with their counterparts. The offending stand off, ”How was our off sides material?” Indeed. Indiscipline from Sacramento State allowed Stanford to keep the ball most of the first half, and score 4 tries. The Hornets scored a try at the end of the half, going to the break with a 17-point deficit. 24 – 7. The second half was much better, with much less infringements, and both teams scoring tries. But Stanford was too good for Sac State today. 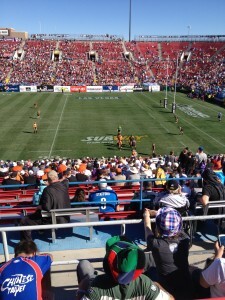 They score 6 tries against 2 in the second half, and won the game 64 – 21. The reserve game was more balanced, but also messier. Players were not as skilled as in the first game at the breakdown, and the ball was very slow to emerge. The score was 22 – 25 20 minutes before full-time, just after a try from Stanford, but Sac State scored 2 more tries and won the game. Very physical game played at pace in warm conditions, in one of the best venues in the country. UC Davis scored first from a turnover in their own half. Stanford replied with three tries to take a 17-7 lead, and they were in command. However, the visitors’ aggressive tackling and effective counter-attacking resulted in two tries, and the teams ended the half tied at 17-17. The intensity increased in the second half, when Stanford pulled away with two late tries. For once a game played in much cooler conditions, as a sunny morning’s sky was blanketed by a thick marine layer (fog) that crept up the hillsides from the coast and settled onto the pitch. Fresno State’s women were no match for UC Santa Cruz, who managed to score early and often enough to make this a one-sided contest. The Banana Slugs put up five tries in the first half against the visiting Bull Dogs, only one converted, making the score 27-0. In the second half six more tried were scored by the home side, and four were converted, with the final tally adding up to 65 points. Fresno State had a few long runs in the second half that were run down by Santa Cruz, saving tries and insuring a shutout performance. Two UCSC players of note were Flyhalf B.J. Rachelle Tenase and fullback Marisa Leone, both injecting pace whenever they touched the ball, and handing off or swerving past would be tacklers, and setting up their backline mates with passes. This was also senior day, and posted on the fence surrounding the grounds cut-out yellow banana slugs with with the names of the senior players on each one. Fun, clean game, very spirited. EDITOR’S NOTE: This kind of tactical analysis and feel for a game is what made Paul Bretz the #1 rated referee in the USA for so long. His attention to detail is why he is doing such a fine job as the NCRRS President. How many of us have officiated in a stadium full of people? 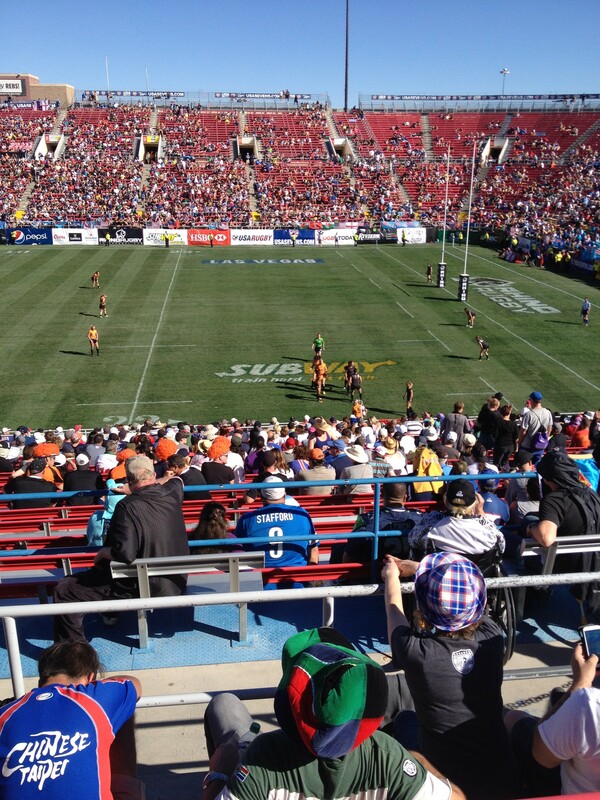 That’s our own Pelicus Saltus in green taking charge of a lineout for the final of the Women’s Elite 7s in Las Vegas. This entry was posted in News on February 25, 2015 by James Hinkin.